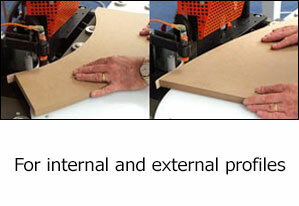 A glue pot edgebander for the application of unglued coil material up to 3mm thick to straight or profiled workpieces. The glue is applied to the edging material from a 1600W gravity fed glue pot. This quick melting glue pot gives a very fast heat up time, and the electronic temperature control gives a very accurate setting and prevents the glue roller from starting until the operating temperature is reached. When working very thick or in-flexible materials heat is applied to the edging material by a 3000W heating element with a separate air motor to aid the application. 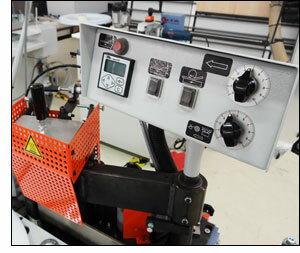 The edge infeed is activated by an electronic eye which sees the start of the panel and activates the tape feed mechanism and an electronic counter which activates the guillotine at a preset length of material. The driven pressure roller infinitely variable from 0-7m/min to assist in the application of materials to straight or profiled workpieces. There are extension tables at each side of the machine giving a total machine length of 2200mm, an extending front support bar fitted with ball rollers and ball rollers fitted in the working table to assist when working with larger panels.